Due to intellectual flight support, the drone flies seamlessly over obstacles, following the best tracking routes. 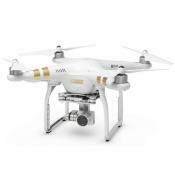 The battery with extended capacity provides a long flight time, allowing you to take more footage. Can be paired with a variety of mobile gadgets. 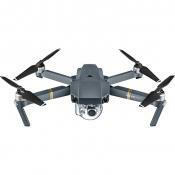 The model is quite pricey, as compared with similar drones. 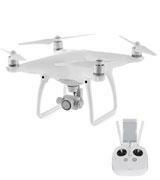 With this intellectual DJI quadcopter, you will capture the best-ever footage from a bird's eye view. Best automatic technology, along with high-end features and software, guarantees the smoothest flights and a fantastic outdoor experience. It is very stable and cuts through the wind very well. The prop guards on the blades ensure their durability. Comes with spare propellers and a 2GB memory card for storage of recorded footage. The copter might pass out of sight in the sunshine. If you need an RC quadcopter that would be both maneuverable and good at shooting video, the Syma X5C is just the thing. 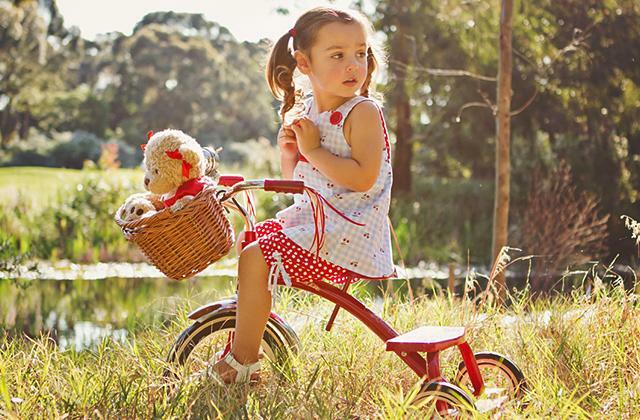 Due to the overall simplicity and user-friendly controls, this quad can be considered a good present for kids. Can be controlled from both a remote controller and your smartphone. Transmits real-time video to your phone or tablet. 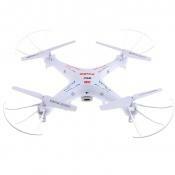 Comes with a spare battery that allows you to extend the flight time several times. The quad is very lightweight, which is why it is not recommended to fly it outdoors when the weather is windy. 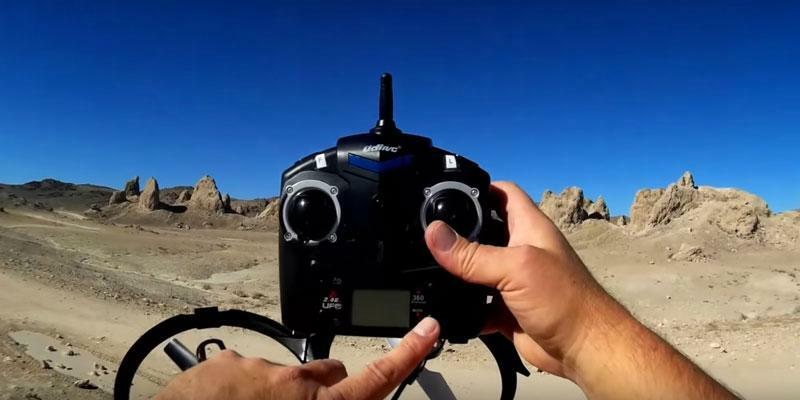 With this FPV drone, you can see the world from a different perspective, watching the live video of your flight from a bird's eye view. 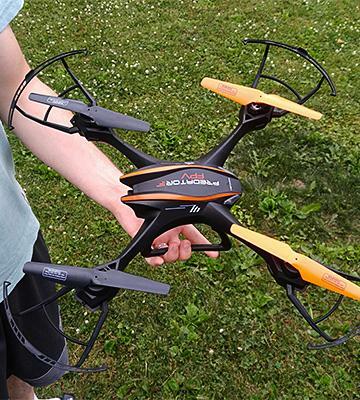 The quad offers a great balance of excellent flying characteristics, small weight, and affordable price. The prop guards ensure safe landing and takeoff of the drone. 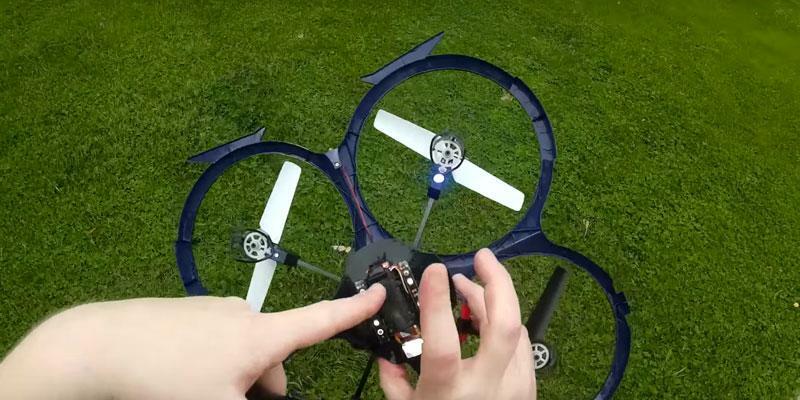 The 6-axis gyro helps control the flight, leveling the thing up after each flip. Multicolored propellers are well visible against the sky. 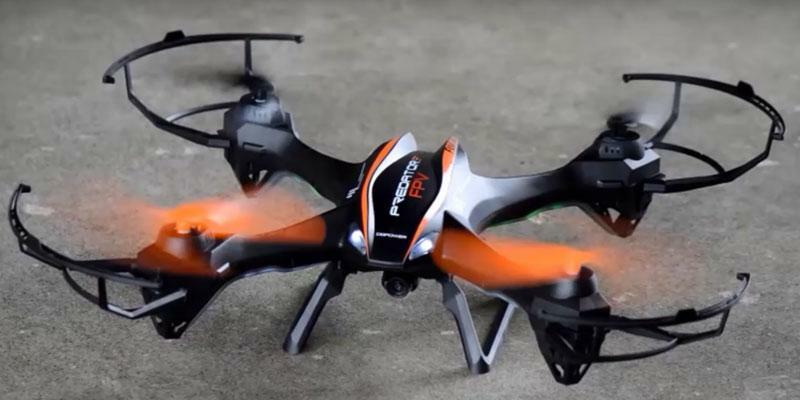 This drone with a camera is ideal for starters. You will quickly learn to control the drone, take amazing videos and photos from the height, and work your way up to become a pro flier. 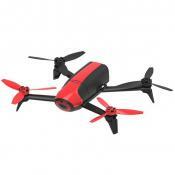 Small size and light weight make this drone a practical solution for both indoor and outdoor use. In spite of its small dimensions, the HS170 boasts a sturdy and durable construction. The drone needs a slowdown before making tricks. 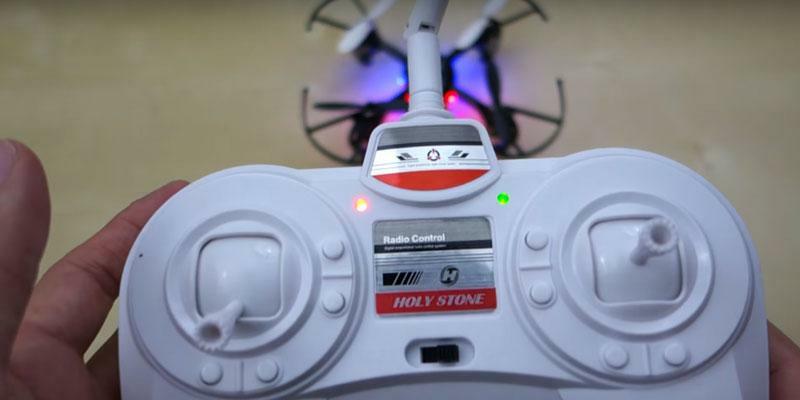 The Holy Stone HS170 is one the best drones for kids and starter pilots. 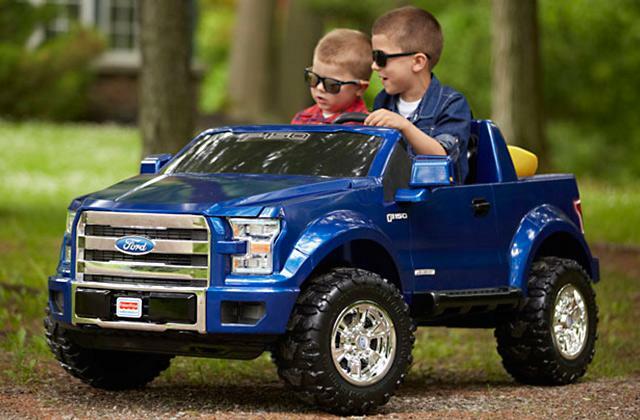 It will bring tons of fun at leisure, allowing you to polish the skills in radio control. 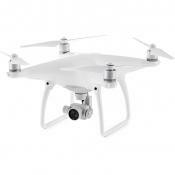 Opting for the Phantom 4 from a big-named DJI, you will get a top-class machine with a bundle of many great features. 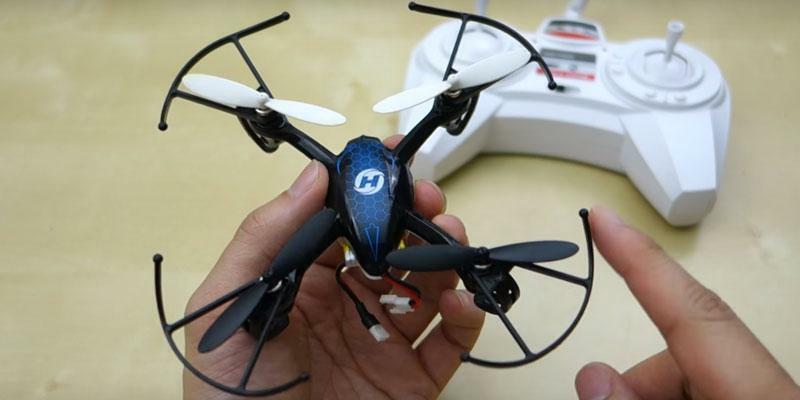 This meticulously engineered copter can give you more than you expect. 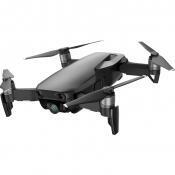 The outstanding feature of this drone, without a doubt, is its 12 MP camera that's able to shoot video at up to 4096 x 2160 with 24, 25 and 30 FPS, as well as Full HD video at 60 and 120 FPS. 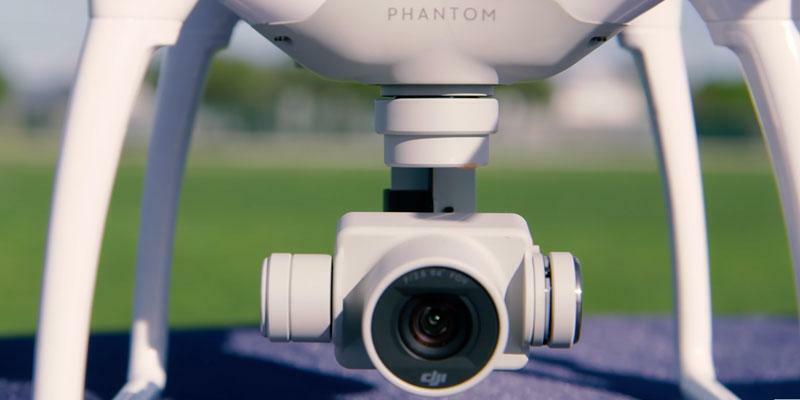 While being similar to predecessors, the Phantom 4 camera still surpasses many of them by far. It uses an eight-element lens for the best-quality footage and vividness. What's more, this RC drone is fitted with an improved motor and comes with an up-to-date remote controller that makes flying the drone easier than ever. 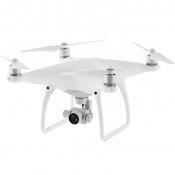 We should also mention that the DJI Phantom 4 drone has a powerful motor and increased battery capacity for a longer flight time. Believe it or not, this copter can stay in the air for 28 minutes. A nice panoramic shot requires a plot and sometimes even a dynamic motion. 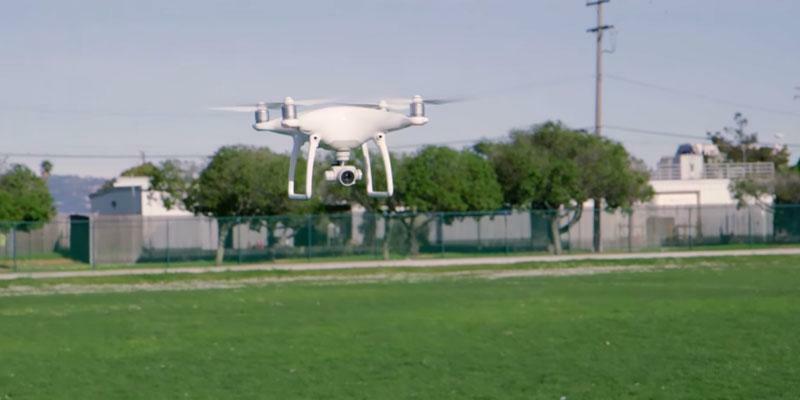 The DJI Phantom 4 quadcopter with a camera will bring you to a new level of video shooting. 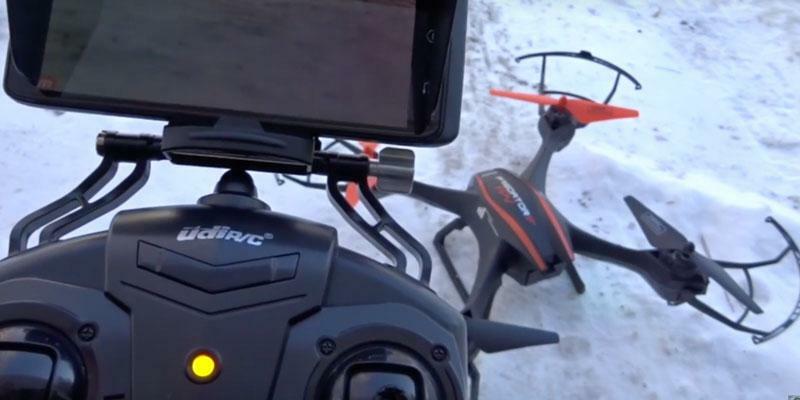 The GPS/GLONASS system will let you realize just about any aerial filming idea, keeping the drone at a specific height and ensuring a stable hovering. 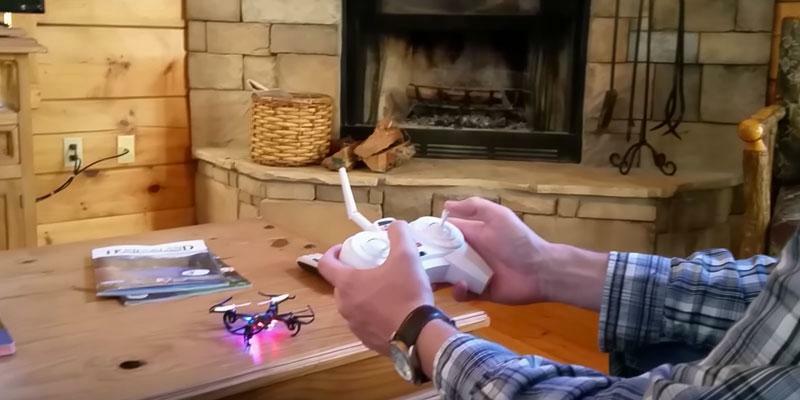 In this RC quadcopter, the designers implemented the brand-new ActiveTrack mode that helps the quad follow the subject which you tap on the screen of your gadget. This way, the Phantom 4 can be used for observation and tracking of objects, still or moving. What's Ahead of Us From DJI? 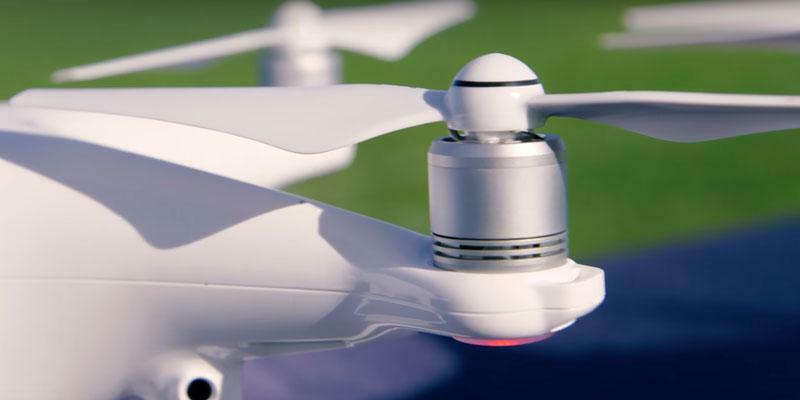 The DJI Innovation has announced its new Phantom 5 copter that was to be released on April 15, 2017. The company members also informed on what the new development will be about, putting stress on the intellectuality. The Phantom 5 will feature the multi-core processor to operate more sensors than previous models. Thanks to this improvement, the designers expect to completely exclude the human control when flying the copter. Still, an operator will be able to change the flight settings whenever necessary. The new Phantom model will also have some innovative flight modes with shooting being one of the most prominent. Finally, the drone range is to be extended up to 6.2 miles. If you're going to fly your RC drone for a long time uptown, you need to remember of the timely recharging. It's impossible to charge batteries while being far from an outlet, so we recommend using a power bank instead. 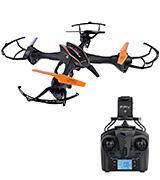 This is a ideal drone for the novices or a seasoned drone pilot. so many great features with good DJI support. Longer flight time: I now get about 20 minutes before I get a low battery warning (30%), as compared to about 14 minutes with the Phantom 3. 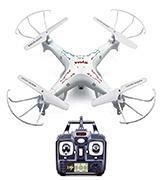 The Syma X5C is a radio-controlled drone that will please you with its versatile functions. 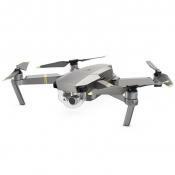 With this drone, your weekends will become brighter and you will be able to shoot and share exclusive video taken from a bird's eye view with your friends. The Syma X5C is fitted with a wide angle HD camera for panoramic imagery and has 4GB MicroSD card for storing the footage. With regards to the camera, it uses a 2MP lens that allows you to capture videos at 1280 x 720 and 30 FPS. Despite this isn't the highest resolution, your footage will still look great. We would also like you to take a note that the camera here is detachable, which means, you can always take it off to make the quad lighter and more maneuverable for racing, for example. The LEDs on the quad make it well visible even against a dark evening sky. Featuring high and low speed modes, the Syma X5C is one of the best options for beginners and suits both for indoor and for outdoor use. The only thing we'd recommend novice fliers, though, is to practice controlling the drone indoors first and only then go in the open air. Doing this way, you will adjust to the quad behavior quicker and will be able to fly it in different weather conditions. 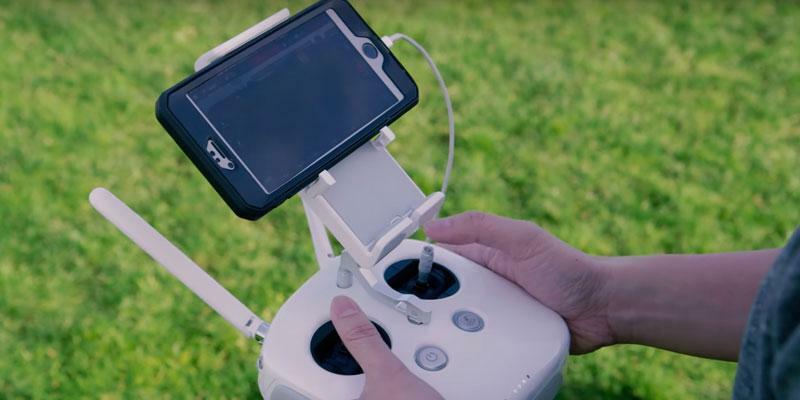 For perfect stability during flights, the quad has been equipped with a 6-axis gyroscope that monitors its position and levels it up after flips. 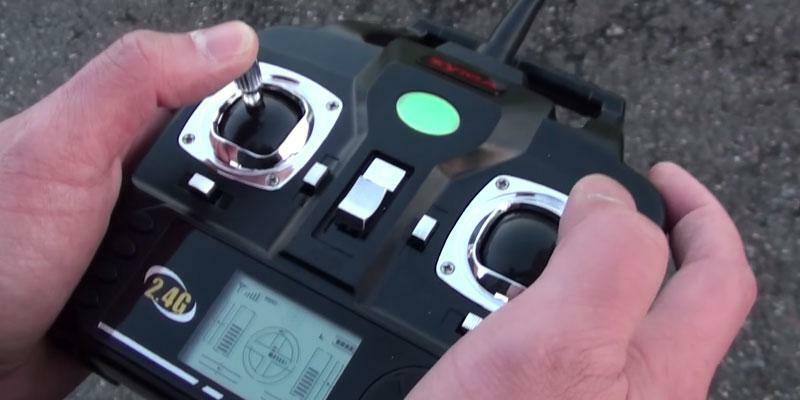 This feature makes it much easier for novice fliers to control the drone. 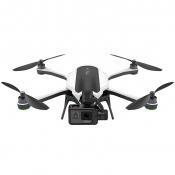 The drone itself is very maneuverable and capable of performing 360-degree flips and tricks on the fly. 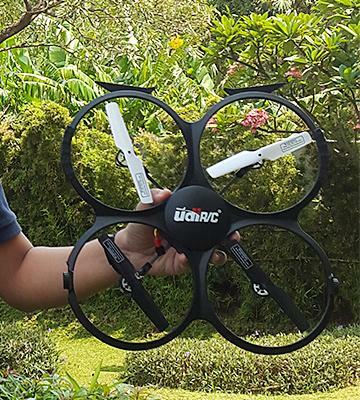 It comes with a powerful controller that can reach the drone within the range of up to 490 ft. The remote employs 4-channel signal transmission at 2.4 GHz and features left and right control levers, 2 trimmers, 2 mode switches, and the on/off switch. Understanding that blades are the most fragile part of any drone, the manufacturer included several replacement propellers in the package. However, they shouldn't get damaged too fast. There are special guards on each blade that protect them from crashing in the event of collisions. We recommend using a card reader to quickly and conveniently transfer your footage from a memory card to a laptop or PC for watching or editing. Human beings have always been striving to conquer the skies by means of the manned aircraft. 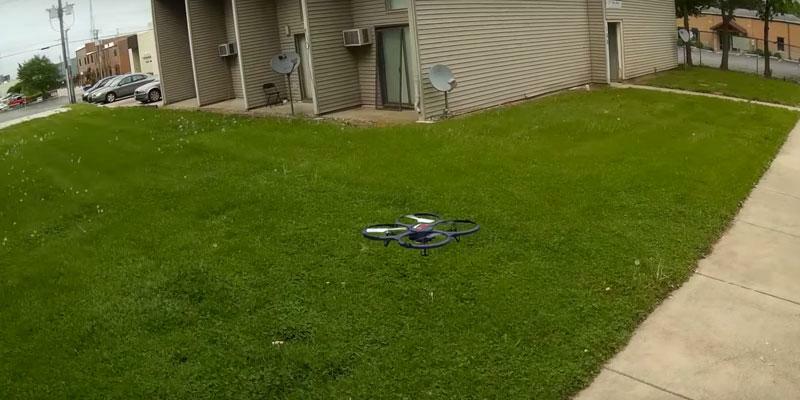 Now, there's no need to buy a plane to fly, an RC drone can raise you in the air. Don't you wonder how? We will explain. The DBPOWER has designed a quadcopter with the FPV (First Person View) option to give everyone a chance to feel on board of the drone. You just need to install udirc-FPV app on your phone and attach it to the controller. When the phone syncs with the guad, it will start to broadcast live video, showing you the view from the height. With the FPV transmission, the UDI842 FPV drone is able to shoot amazing photos and videos and enables you to share them online with your friends from mobile devices. Besides FPV broadcasting and HD camera, there are some more extras that make the DBPOWER UDI U842 a worthy buy. The package, along with the drone, includes two spare batteries that you can use to extend the flight time. The batteries are all rechargeable; you will only need to make sure that you've got a device with a USB port at hand. The DBPOWER UDI U842 can also be charged with a power bank; thus, if you've got one, make a habit of carrying it around. For easy tracking and for more realistic look, the drone has been fitted with LED lights that help outline it against the dark sky. The option to control the drone with a gyro of your phone is another advantage of this model which is worth your attention. Love the Life Your Live! Along with a quadcopter, you might just well want to consider getting an action camera for shooting outstanding footage on the move. Predator U842 Wifi FPV Quadcopter Drone With HD Camera Review- Live Footage from iPhones & Androids! 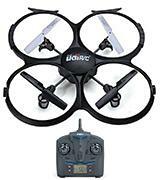 Looking at the UDI U818A, you may quickly run to a conclusion that this drone looks pretty much identical to many other quadcopters. And you will be right. 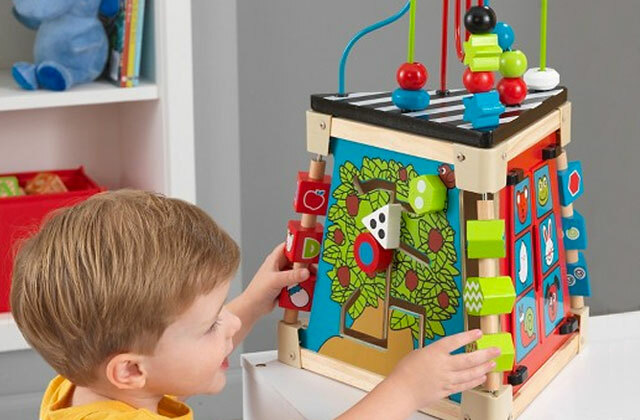 The manufacturer didn't pursue the goal to create something unique. What they did is they took a classic model of drone and tuned it up a bit. Once you activate the quad, it will start to pair with a controller. Within less than 3 seconds, you will hear a beep signaling that connection is done. This RC drone with a camera, despite being small in size, stands the wind very well, even when it's up to 9 m/h. It has a 6 axis gyro that improves its stability, prevents it from going into spinning, and provides a better control over the flight. 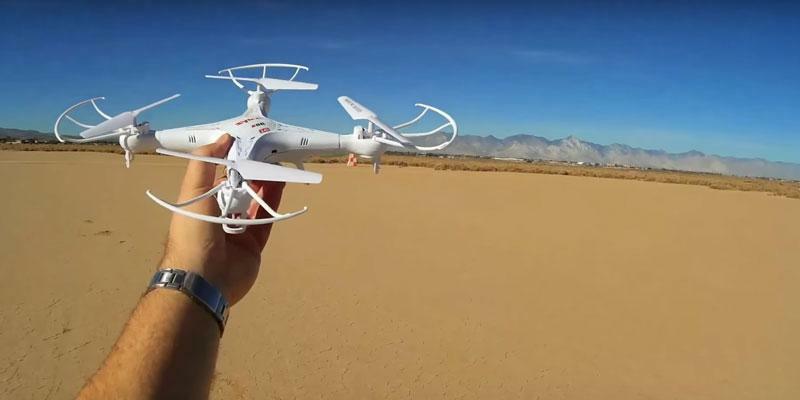 The combination of all these features ensures that even a starter can soon become a proficient flier, even if he/she has never flown a drone before. 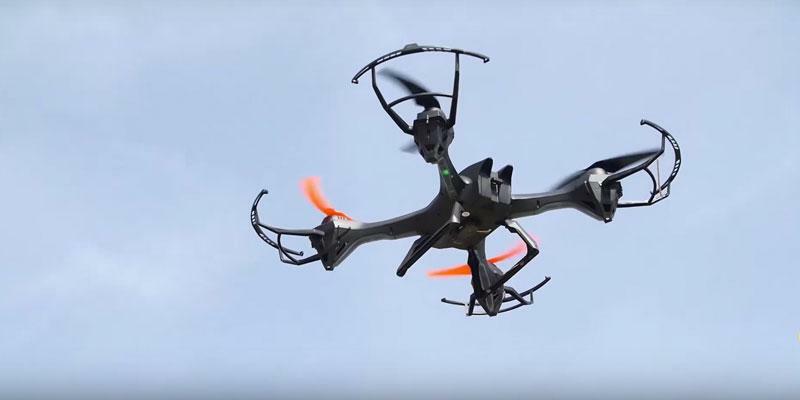 Despite the fact that this RC quadcopter is considered to be a mid-price model, designers approached it with verve, implementing several solutions to extend its range and capabilities. 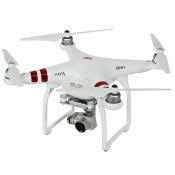 The quadcopter comes with a camera for capturing videos and wide-angle images in motion. The camera has a 0.3MP lens and records clear and smooth footage at 640 x 480 and 30 FPS. The U818A 4 CH 6 is very lightweight and maneuverable and comes with a handy remote for easier control. 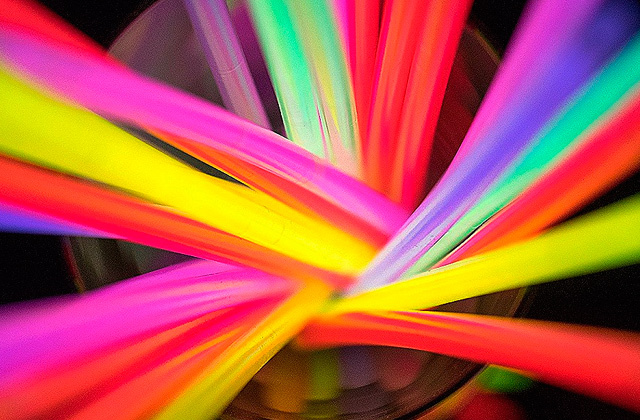 Without a doubt, the UDI U818A can provide you with endless hours of fun and is certainly worth your consideration. The John Hopkins University researchers designed the quad which can be immersed a few meters underwater and run there for months and then, on receiving a signal, come out to the surface to execute the scheduled tasks. This drone is 3D printed and treated against corrosion to withstand a harsh saltwater environment. When being out in the countryside, flying the quad, shooting images, the last thing we want is for the quad to run out of charge. Thus, it may be a good idea to take advantage of the bright sunlight and use a solar charger for recharging the drone. Also, the camera works ok, but the video feature is really neat for a beginner. I would recommend this to anyone looking to get into this without breaking the bank. 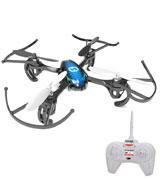 It is a great quadcopter. I can use its camera function to record the this quadcopter's wonderful flying action. 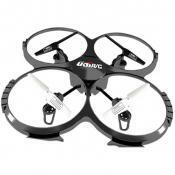 The UDI 818A is a great quad-copter. 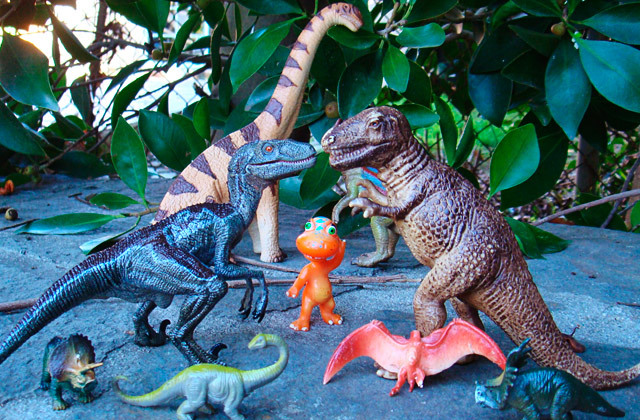 It is very durable, flies well and maintains flight for about 10 minutes. The light weight of the UDI 818A means longer flight times. Unfortunately, it also means this quad is very susceptible to any breeze or wind faster than 4 or 5mph. The Holy Stone HS170 is crafted to bring a pure delight. 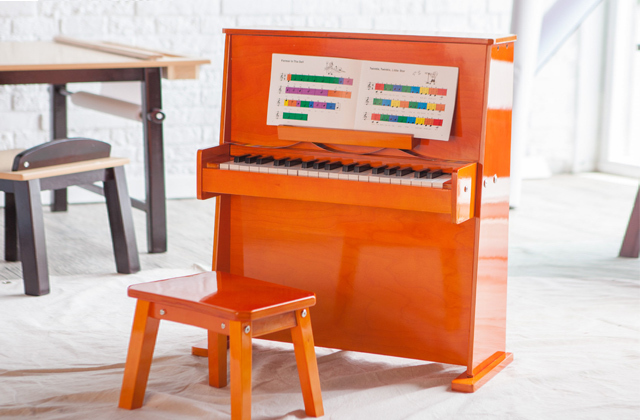 Miniature in size, it will captivate your attention right away. Looking at the quad in action, it's hard to believe that such a little thing can be that swift. 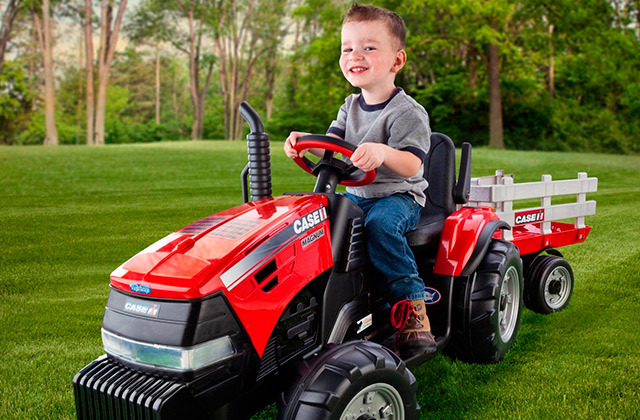 Still, the manufacturer managed to make this quad suitable for both kids and grownups. It's lightweight and sturdy to survive bumps even in the rush of flight. So, you can be confident that it won't break apart in the first collision. The blades of the Holy Stone HS170 are protected with guards that exclude direct contact with other objects, thus protecting them from damaging. The length of flight on a single charge makes about 6-8 minutes which isn't very long but surely more than enough to train flying the drone and perfect your reaction in radio control. 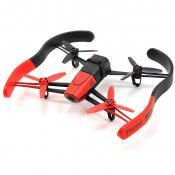 This RC quadcopter has 3 speed modes that come in useful in different locations. Thus, if you decide to let your drone soar indoors, you'd want to fly it at the lowest setting. Whereas if you decided to test your drone in the wind, switching to medium and high speeds would be a better idea. To make it easier for users to track the drone in the air (don't forget, it's small), it's been equipped with bright red and blue LEDs, while in order to make it more convenient to control, it comes packed with a user-friendly remote controller. Remote control quadcopters are certainly cool, however, they aren't the only helicopters that can give you fun. 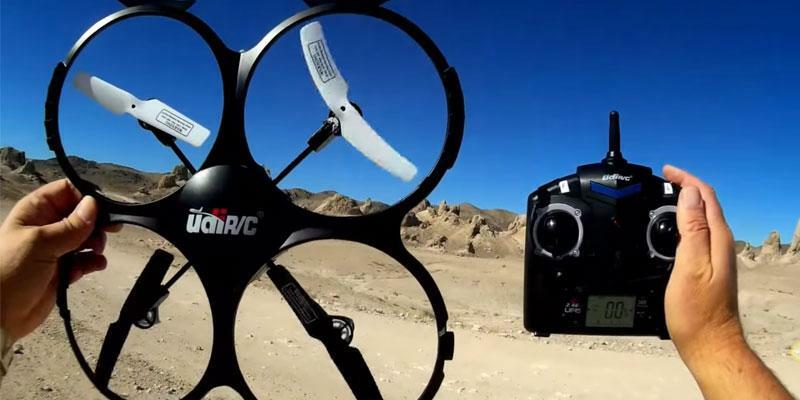 If you're considering several ideas as to what to buy, a quad or some other RC vehicle, we can offer you to go through our latest review on tricopters. 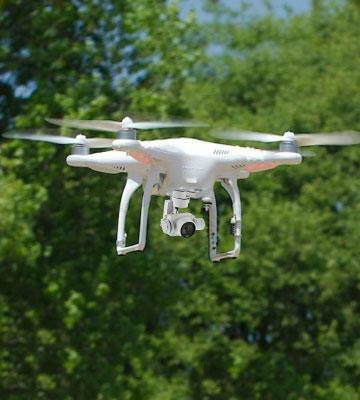 In this day and age, unmanned aerial vehicles (UAV) are rapidly gaining in popularity. Not surprisingly, the world has completely been taken off by the drone craze in just a few years after it was introduced to the first drone. So, what is a quadcopter exactly and what differs it from conventional helicopters? 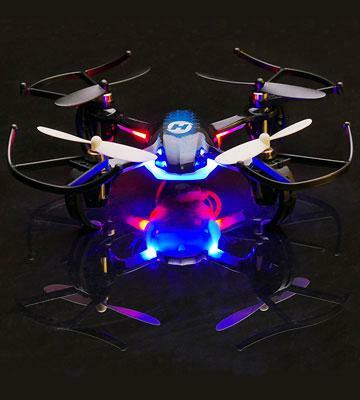 A quadcopter is a remote-controlled helicopter that employs 4 pitched propellers to fly. Unlike conventional helicopters, quads are small in size and have considerably smaller blades which come advantageous as they are easier to control and maneuver. With cameras attached, quadcopters offer limitless joy and fun, allowing you to take high-res photos and videos right from the sky. Does it come as a surprise that some big commercial systems now use drones for delivery purposes? With one of the drones we've selected for you, you will no doubt have fun you've never experienced before, and see the world from perspectives you couldn't have captured other way. 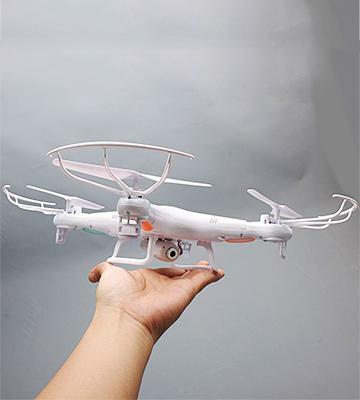 Given a variety of models presented on the market, first thing first you need to decide for yourself what it is exactly that you want to buy a quadcopter for. Drones may come in many different sizes and have a great score of different features that you may or may not need. 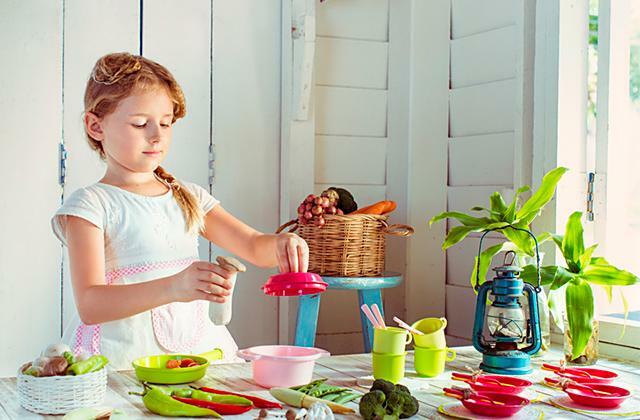 If you want to buy a drone for your child, you will probably not want to go for the most expensive model. And another way round. If you're already a proficient user with a high skill level, a cheap model will not let you move with progress. Consider the size of the drone. 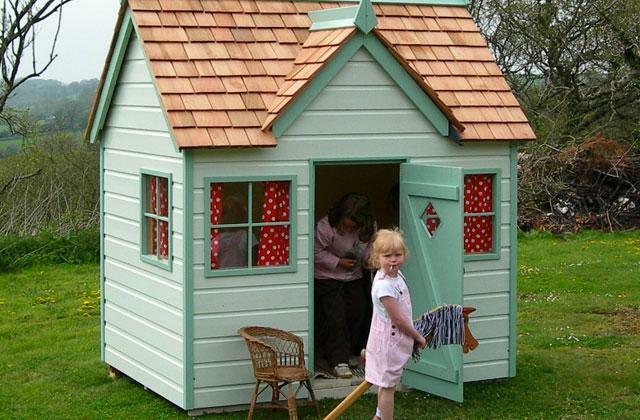 The bigger and sturdier it will be, the better it will go through the wind resistance. You will also need a bigger drone to fit it with a camera (unless the drone already has it). Apart from flying, quads can perform a range of functions that may vary depending on the grade and intended use. With respect to quadcopters with cameras, it's important to learn the camera specs. Using a high-definition camera, you get a chance to capture the vibrant views from the height. Accessory functions like GPS or gyroscope considerably ease the drone use. Some customers fly their drones in competitions and if you pick one for that, make sure to get convinced that it's maneuverable and capable of performing tricks and flips to boost your odds of winning. 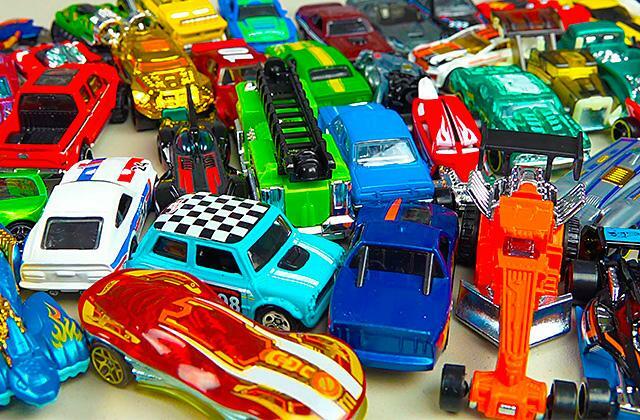 Keep in mind, however, whatever model you choose, you may still want to investigate the specs thoroughly, as there are so many of them that it's hard to cover them all. Design and flight performance are another features that should be taken into consideration. Check durability and what additional accessories the drone has to reduce the chances of its damage. Find out the flight time to know how long the drone will fly with a single charge, and what control options are available (a remote controller, smartphone). Check out the range and distance to which a quad can fly before losing contact with you. Knowing all of these specifications, you will get a full picture of how mobile, durable and practical the drone you're buying. A: There are quite a few of reasons for a flyaway. Maybe your quad is in the wrong flight mode? If it is, the lever on your controller will not be responding. Check your controller, is it working? Is it switched on? If your controller was being switched off, your quad could have gone into a "fail-safe mode" to fly back to you (if you've got a GPS signal before flying away). Switch the control mode (from GPS to manual and back again) to get your drone out of fail-safe mode. The controller batteries are dead. If so, you need to wait for your drone to fly back to you. There is some interference with your radio. 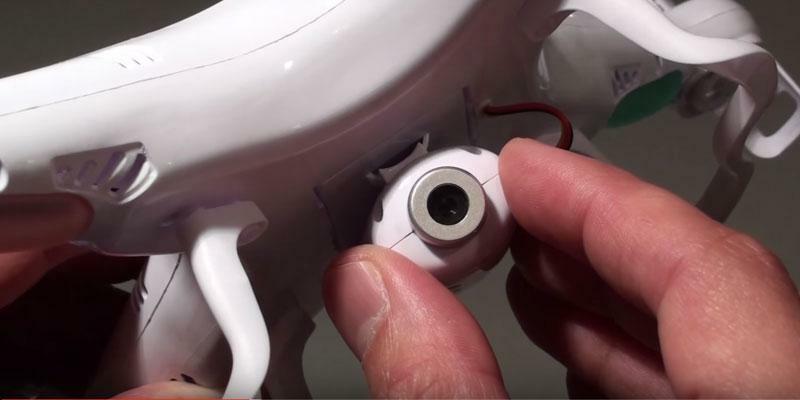 If you switch your controller off (or otherwise activate a fail-safe mode), your drone should enter a failsafe mode and fly back to you. If you use a GoPro camera with WiFi on, it might interfere the signal transmission from the controller, as they employ the same 2.4 GHz frequency. Switch WiFi off, this can help prevent interference and regain control. A: Like all helicopters, quads require regular maintenance. Clean it off debris and dust after each flight, ensuring that no twigs have been left in in crevices and tight places. 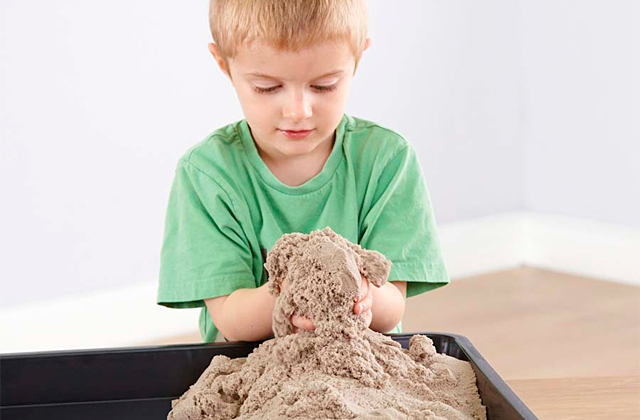 To do this, you will need to use either a special brush or a pipe cleaner. A canned air can also help force dust particles out of tough-to-reach spots such as around the motor, etc. If you haven’t got any special cleaning brushes, you could try wiping it with a usual microfiber cloth. Also, make sure to find out whether or not the motor of your copter requires greasing. If it does, you will need to go buy a special lubricant and use it before every flight.